Location: Poway. 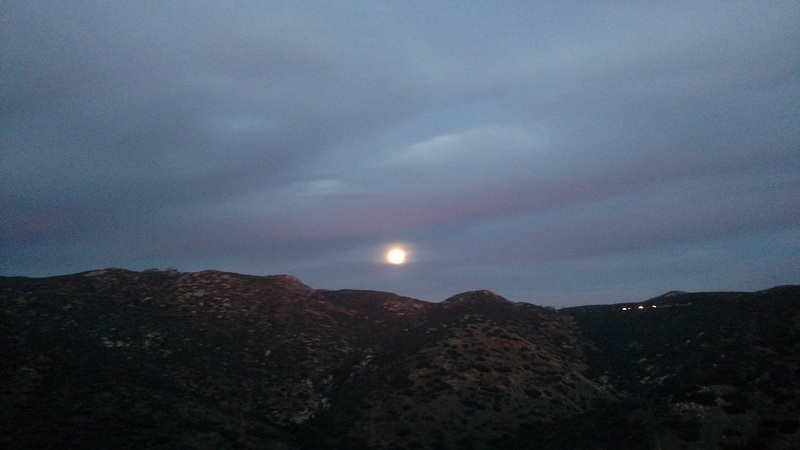 From San Diego, take Interstate 15 north to Ted Williams Parkway (exit 19). Turn right and head northeast for 2.5 miles to Twin Peaks Road. Turn right and go 2.3 miles to Espola Road. Turn right and go 0.4 mile to Range Park Road. 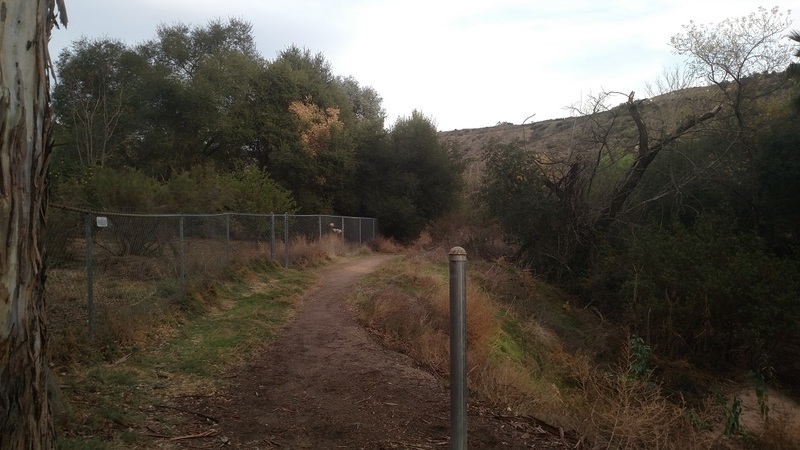 Turn left and go 0.2 mile to a trail head located between two houses. Alternately, from the north, take Interstate 15 to Camino del Norte (exit 22). Turn left and follow Camino del Norte, which becomes Twin Peaks Road, for a total of 4.2 miles to Espola Road. Turn right, go 0.4 mile to Range Park Road and turn left. The trail head will be on the right side of the road in 0.2 mile. The approximate address is 14451 Range Park Road, Poway. Sticking up from the hillside like a rogue molar, Tooth Rock is a recognizable landmark in Poway, perhaps not quite as renown as Potato Chip Rock but still popular. 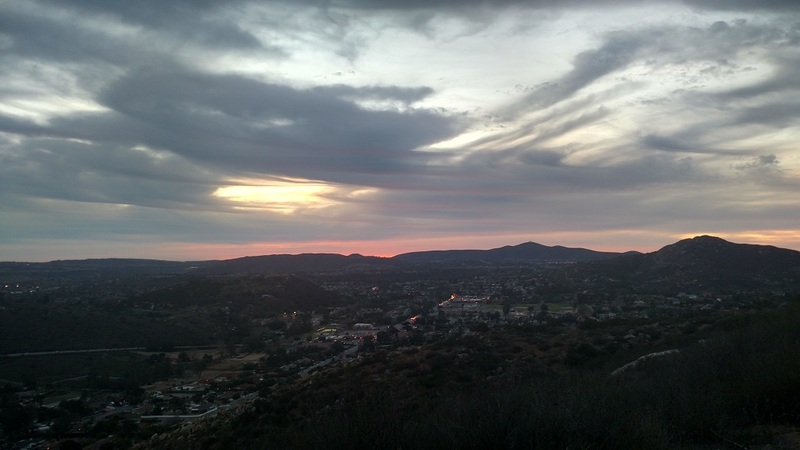 Unfortunately, its popularity has led it to become heavily vandalized, but it is still an enjoyable hiking destination and can provide exceptional sunset views (just make sure you allow enough light to get down the steep ridge safely). Several official and unofficial trails cross the area, making for multiple possible routes. 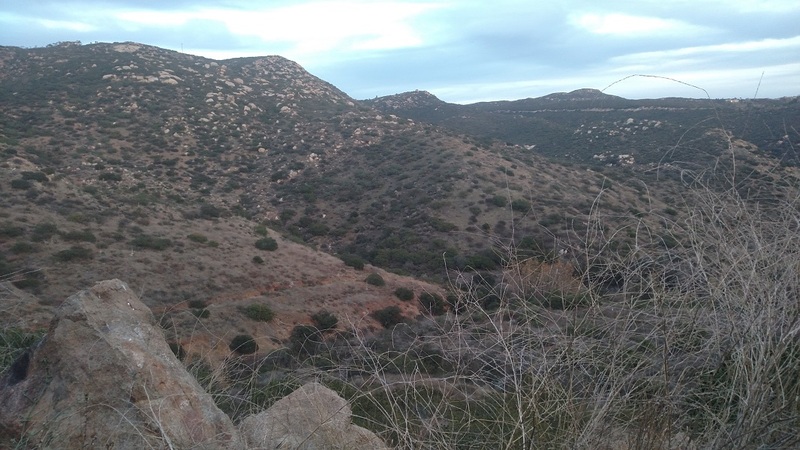 This write-up describes the route from “Afoot and Afield San Diego” which is a good choice for a moderate workout that can be knocked out in a couple of hours. Begin by following the trail off of Range Park Road east for half a mile. To the left, Tooth Rock can be seen protruding from the hillside. Half a mile from the beginning, as the trail runs alongside a grove of oaks, you will reach a Y-junction. The steep left route is the return (although hikers who want a quick and intense workout can reach Tooth Rock by climbing up it, gaining about 300 feet in a quarter mile.) To do the loop, bear right and follow the path as it parallels Rattlesnake Creek. At 0.7 mile, you reach another junction. 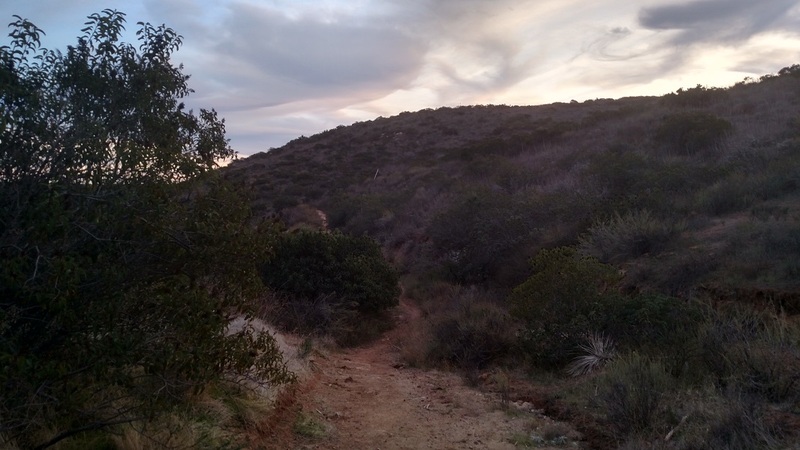 Turn left on an easy to miss trail that heads north into a tributary of Rattlesnake Canyon. 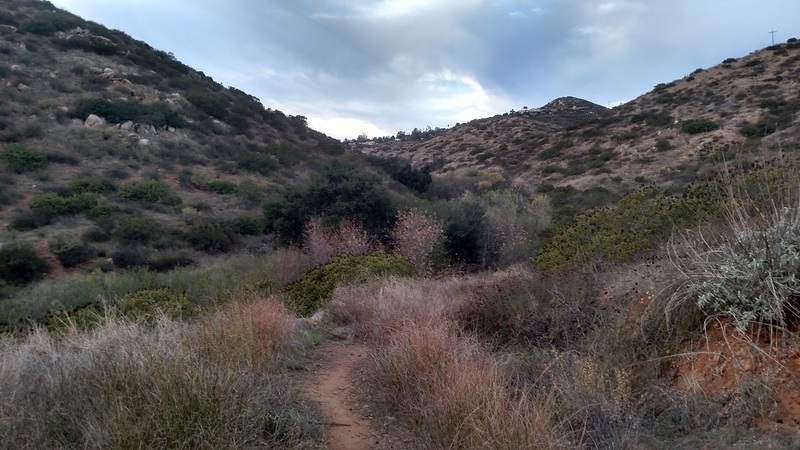 The next stretch is pleasantly wild and rugged for a suburban hike as you enter thick riparian vegetation. Be careful during one particular stretch that has seen massive erosion (hands will probably come into play). The trail then climbs out of the canyon, reaching a junction at 1.3 miles from the start. Here, you make a hairpin left turn and head south. This enjoyable stretch of the trail traverses the western wall of the canyon. On the opposite side the view is dominated by the antenna-dotted summit of Mt. Woodson and Iron Mountain farther south. 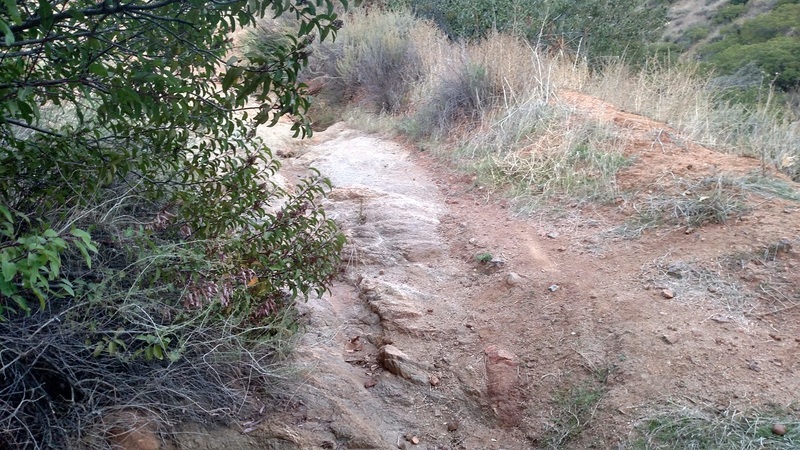 At 1.9 miles, as the trail bends to the left, look for a use path heading up to the ridge below Tooth Rock. The graffiti is hard to ignore, but there are still some impressive views to be had from this spot. 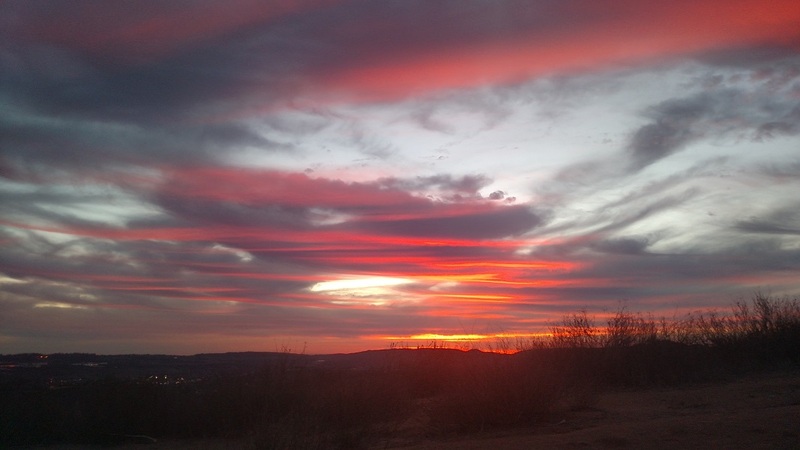 To the west, Black Mountain’s characteristic pointy summit towers above Poway and the other nearby San Diego suburbs. After retracing your steps, continue south along the main trail. Be careful on the steep and often loose terrain as the trail drops off the ridge, rejoining the first junction at 2.6 miles from the start. Here, follow the trail half a mile west back to your car.